Double Dhamaal has an opening weekend of over 25 crore nett at the Indian Box Office which is the second best of the year after Ready. The film had got a really good first day but due to the mixed reports it seemed that it will show significant fall over the weekend however that was not the case as it was the only release this weekend with no Hollywood release as well while the films released in last week had already tanked at the Box Office. It is yet to be seen if it is able to hold up in the weekdays but the film has already done well enough for itself to be called a success. 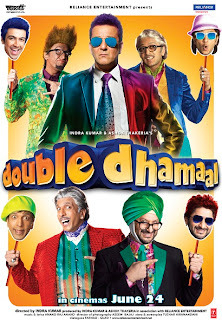 Despite being the solo release and a comedy, the success of Double Dhamaal has come as a surprise since it had no major face value and even the promos did not seem good. These shows that the sequels and franchisees of successful films do have a big edge at the Box Office over other films due to the familiarity factor. Most of the sequels released since 2006 have done extremely well at the Box Office, Golmaal being the most successful franchisee and in case of Dhamaal 2 it was for the first time that as many as all 5 leads of the first film were repeated in the sequel playing the same characters. All the releases of the last week showed a drastic fall this weekend while most of them hardly got any screens this week. While Ready which is in its 4th week now collected nearly 2 crore nett in the weekend which is good considering the majority of its screens were replaced by Double Dhamaal which is also a comedy. Next weekend sees the release of the much awaited Aamir Khan Productions' Delhi Belly and Amitabh Bachchan starrer Bbuddah Hoga Tera Baap. Delhi Belly is expected to open huge, the only limiting factor for it being that its an Adult rated film. Bbuddah Hoga Tera Baap is also expected to do well as it has got a good buzz and is a relatively low budget film. The weekend will also see the release of Hollywood biggie Transformers 3 which will surely attract the Hollywood enthusiasts.